Governmental involvement or endorsements--as represented by Davidson's presence--is key to convincing potential investors to choose one project over many competing ones. Forest City also offered a misleading explanation for how the funds would be used, suggesting they would go to critical infrastructure rather than replacing a high-interest loan used to purchase land for the project. Forest City Ratner got a below-market loan to help replace that loan and (perhaps) pay for infrastructure. ESDC spent about $4,400 on Davidson's travel, plus the value of his time--and the goodwill/reputation of the state agency. 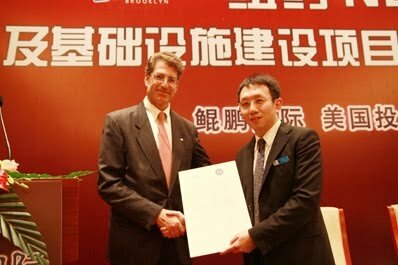 Davidson was clearly valuable to the effort, mouthing misleading platitudes about Atlantic Yards and bestowing boilerplate certificates on Chinese immigration brokers (as in the photo at left). Those certificates were requested by the private firm managing the investment project. However, ESD, documents suggest, didn't ask for anything in return, such as additional performance guarantees or a tighter timetable. That suggests that the agency has no interest in tying the Greenland deal to a revised timetable. While Atlantic Yards was long promised to take ten years, the state relaxed deadlines in 2009 to 25 years. While the Greenland deal has been touted as a way to speed construction, Forest City and allies like Bertha Lewis don't want to be forced to commit to a new timetable. 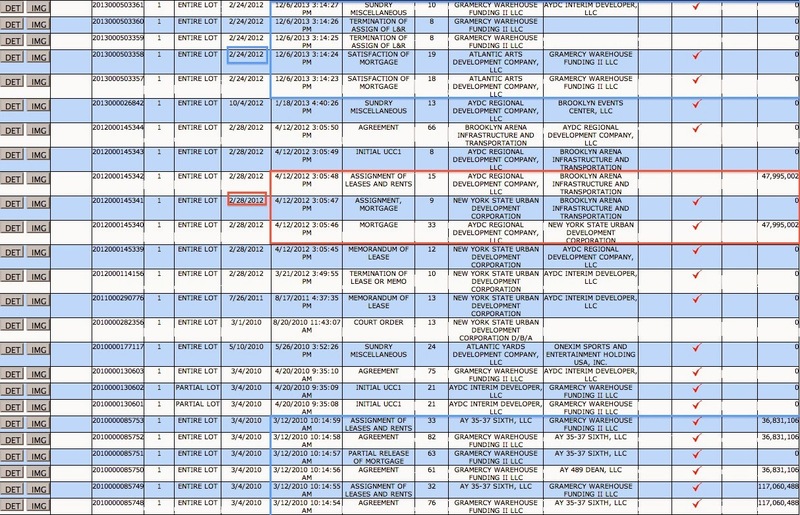 The documents, acquired in June 2012 response to a Freedom of Information Law request I filed nearly 21 months earlier, suggest that, when Forest City made contact with the office of then-Gov. David Paterson, Davidson's role was set in place. So much for Ratner's claim, in an August 2012 interview (video) with the Wall Street Journal, that "When you work with government, it's heavily on a staff level. It's really more about working on a staff level. On that level, we work in a very unpolitical way. We work just on the merits." The documents show Forest City has made shifting claims about the intended use of the funds from the immigrant investors, who get green cards for themselves and their families if they invest $500,000 in a purportedly job-creating enterprise. 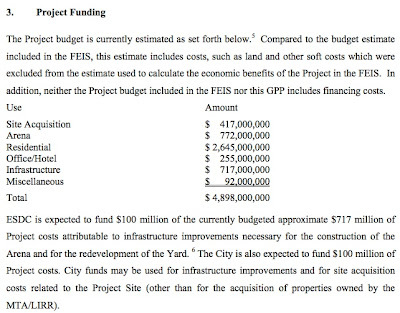 According to one document recently unearthed, Forest City told the ESDC that the money--initially, $249 million--would go to critical infrastructure, given that the arena was already funded. To the press, however, Forest City was more coy. It told the Wall Street Journal and the New York Times that the funds would go for infrastructure (the new railyard) and also to replace a higher-interest loan used to purchase land. 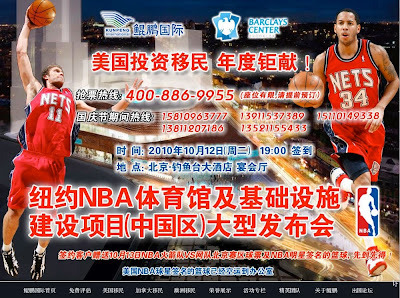 Representatives of the New York City Regional Center (NYCRC), the private firm engaged to market the investment, told potential investors at public events and on webcasts in China that the money would go to an arena. Just look at one promotional poster (right) for an event aimed to recruit investors. However, as I reported, the arena was already funded. That's surely worthy of investigation for fraud. 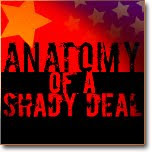 Still, it's likely that contractual documents signed by the investors were more fuzzy regarding the arena. After all, they were buying into something vaguely titled "Brooklyn Arena Infrastructure and Transportation Improvement Fund." That string of words might suggest "Brooklyn Arena" as an entity, but more likely as a modifier. Forest City more recently said the money is funding the new subway entrance, parking facilities, municipal water and sewer line upgrades and other work, according to Business Week. However, evidence suggests, as I reported, that the money is also going to substitute for an existing high-interest land loan. 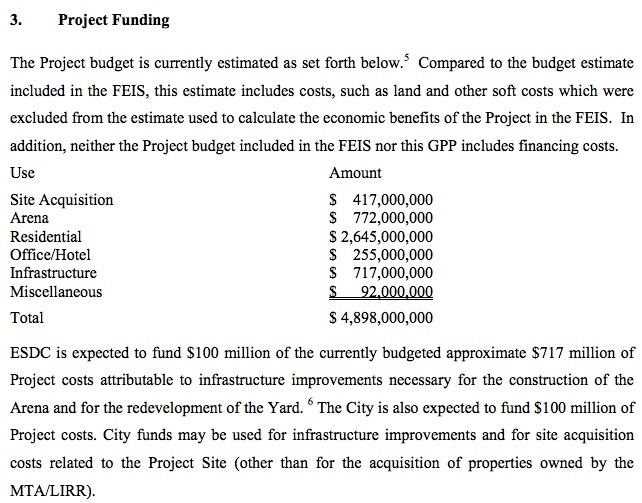 For each component of the $228 million, such as the $48 million used to secure the sites for B13 and B14 on the southeast block of the project site, city records indicate that an existing mortgage from Gramercy Capital--which specializes in high-interest financing--after a new mortgage was signed with the "Brooklyn Arena Infrastructure and Transportation Improvement Fund," representing the immigrant investors. See graphic at right, and right-click to enlarge. That margin for the developer came with help from the government. 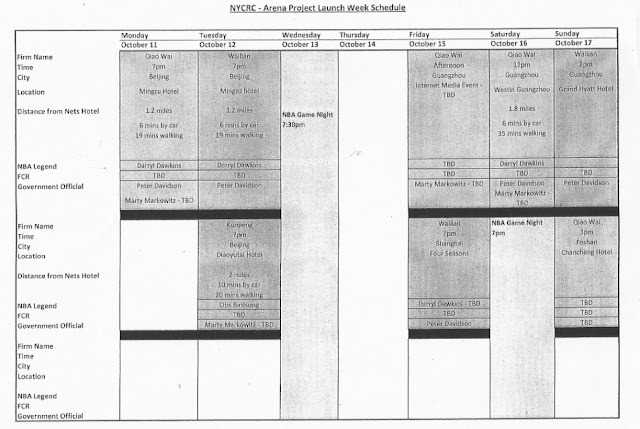 As I reported, the process began on 2/17/10, when the New York City Economic Development Corporation (NYC EDC) proposed that Forest City Ratner meet with the NYCRC, the private investment pool authorized to recruit investors, to discuss a collaboration. The city agency knew that Forest City Ratner needed to raise more money to move the project forward and still achieve the margins it sought. Neither the city nor state government was a formal partner with the NYCRC in the project, though that's what Chinese investors were told. Though the project brochure, at left, used the city and state seals to suggest government involvement--as well as the NBA logo--each government entity had made previously-funded subsidy commitments. In a 7/27/10 email, Forest City Executive VP MaryAnne Gilmartin broached the issue with Davidson: "Called Bruce [Ratner] on another matter. 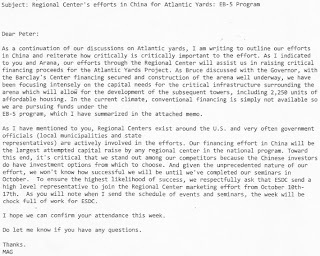 Bruce raised the Regional Center and the China Trip in October. Governor seemed interested. Wanted you to have a heads up." 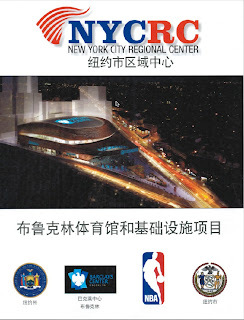 EAST RUTHERFORD, N.J.—NETS Basketball has been selected to play in NBA China Games 2010, in which it will participate in two preseason games against Chinese icon Yao Ming and the Houston Rockets in Beijing and Guangzhou this October. As I indicated to you and [Atlantic Yards Project Director] Arana [Hankin], our efforts through the Regional Center will assist us in raising critical financing proceeds for the Atlantic Yards Project. As Bruce discussed with the Governor, with the Barclay's [sic] Center financing secured and construction of the arena well underway, we have been focusing intensely on the capital needs for the critical infrastructure surrounding the arena which will allow for the development of the subsequent towers, including 2,250 units of affordable housing. In the current climate, conventional financing is simply not available so we are pursuing funds under the EB-5 program, which I have summarized in the attached memo. That's a bit of a dodge. "Conventional financing" is never available for infrastructure. It's available for investments that have a return. By contrast, infrastructure is typically funded through other means, including bonds, the overage from other project elements, equity, or direct subsidies. It's more complicated in this case: Forest City's low price for the Vanderblit Yard development rights--$100 million, later amended to $20 million down, with the rest paid off over 22 years--was predicated in part on its infrastructure investment (that new railyard), given that the rights were appraised at $214.5 million. Indeed, there was an infrastructure gap, beyond the subsidies and tax-exempt bonds. At one point it might have been filled by bonds issued by the Brooklyn Arena Local Development Corporation, but that plan was scotched. A state spokeswoman said in December 2009, "any additional funding required will be made available by Forest City Ratner Companies." Forest City apparently found that solution in China, with New York State's help. As I have mentioned to you, Regional Centers exist around the U.S. and very often government officials (local municipalities and state representatives) are actively involved in the efforts. Our financing effort in China will be the largest attempted capital raise by any regional center in the national program. Toward this end, it's critical that we stand out among our competitors because the Chinese investors do have investment options from which to choose. And given the unprecedented nature of our effort, we won't know how successful we will be until we've completed our seminars in October. To ensure the highest likelihood of success, we respectfully ask that ESDC send a high level representative to join the Regional Center marketing effort from October 10th-17th. As you will note when I send the schedule of events and seminars, the week will be chock full of work for ESDC. Chinese investors have greater confidence in projects with government involvement. 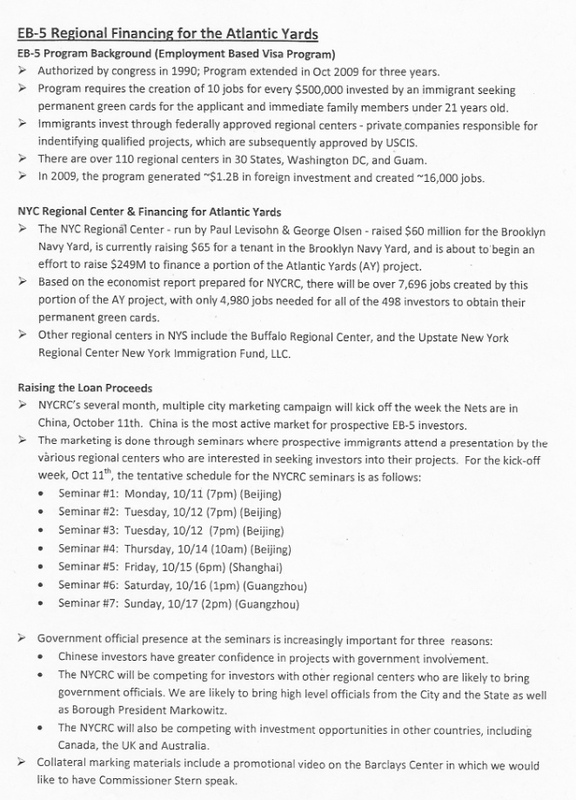 The NYCRC will be competing for investors with other regional center who are likely to bring government officials. We are likely to bring high level officials from the City and the State as well as Borough President Markowitz. The NYCRC will also be competing with investment opportunities in other countries, including Canada, the UK and Australia. The memo also noted that collateral marketing materials would include a promotional video on the arena "in which we would like to have [NBA] Commissioner [David] Stern speak." Commissioner Stern, perhaps prudently, did not appear in the video. However, project promoters did manage to use the NBA logo in their marketing material. No other high-level officials attended, though Markowitz and Mayor Mike Bloomberg appeared in a video, the latter offering boilerplate praise for Atlantic Yards, unrelated to the investment at hand. Markowitz offered effusive praise for Forest City--The most important thing: they make a promise, they keep it"--and claimed Brooklyn was "1000 percent behind Atlantic Yards." Two days after Gilmartin's message to Davidson, it was all in place. Thanks for following up so quickly with the information that Peter had requested. 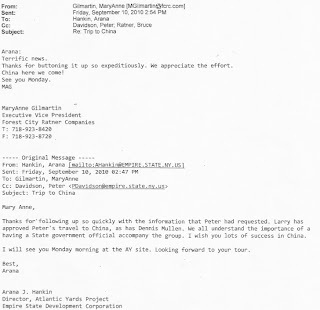 [Secretary to the Governor] Larry [Schwartz] has approved Peter's travel to China, as has [ESD CEO] Dennis Mullen. We all understand the importance of having a State government official accompany the group. I wish you lots of success in China. Thanks for buttoning it up so expeditiously. We appreciate the effort. A schedule indicated eight seminars, including five at which Davidson was expected to appear, and for four which Markowitz was TBD [to be determined]. At each event was an "NBA legend," Otis Birdsong or Darryl Dawkins. They were selling basketball to the Chinese, not infrastructure. Please know how pleased we are that you will be joining us for our "project launch" in China the week of October 11th. Showing government support of an EB-5 project is critical and having someone of your stature present will provide a significant boost to our collective efforts. Per our discussion, we need the Proclamations using the attached language to the immigration firms below. Each firm would receive their own Proclamation. You will present the Proclamation to the Head of the firm at each seminar. Not only will the Atlantic Yards Project provide a state-of-the-art, multi-purpose sports arena needed to bring a professional sports team back to Brooklyn. It will also provide critical infrastructure work necessary to allow the construction and operation of the arena and, over the course of the next decade, the construction of thousands of affordable and market-rate housing units. This is a historic project that will continue to energize the borough of Brooklyn. While a new hometown team will give all of us something to cheer for, it's the jobs and housing that will have the greatest last impact on the borough and the people of Brooklyn. The Atlantic Yards development is not just about constructing buildings, it is about building a stronger future for this great City and State. This is why the State of New York has already spent $100 million of capital to prepare for this development. None of that offered any indication that the immigrant investors would get their green cards or get their money back. 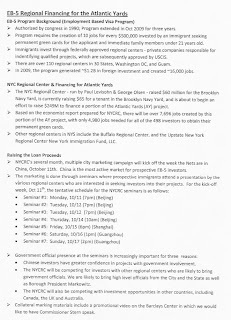 The itinerary began with an arrival at the PNY Center on 10/10/10, a bus to Newark airport, and a flight to Beijing. The trip involved a "Champagne Welcome for Nets Travel Party" and a "tailor to measure for suits." The visit included two Nets games, various tours, and a departure, in the evening on 10/16/10, arriving the next morning. Davidson and Forest City got fairly chummy. 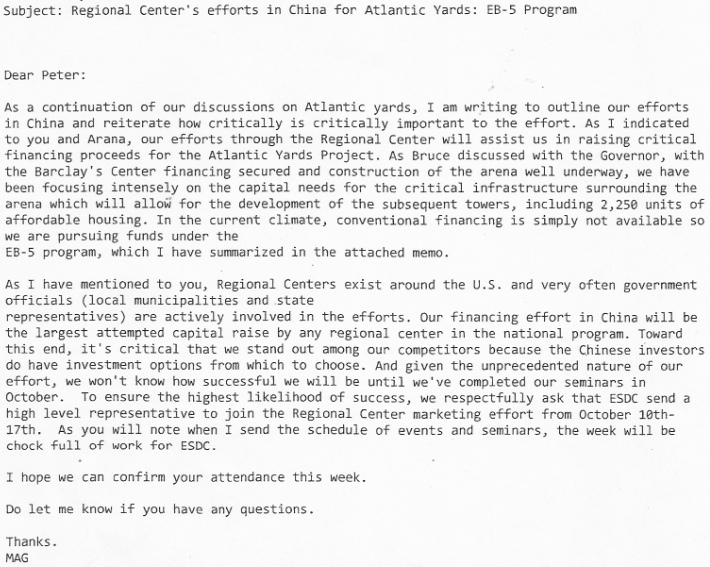 For example, at one point, Gilmartin wrote: "Bruce and I would love to have you join us for some site [sic] seeing while we are in China." 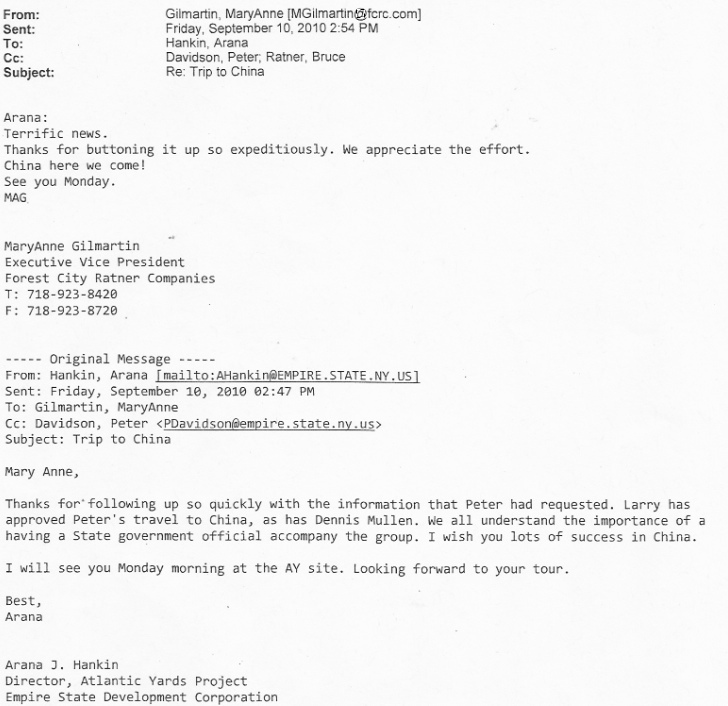 Davidson assented on a trip to the Great Wall, and then reciprocally invited Gilmartin and Ratner to a site "being worked on by the World Monuments Fund, whose board I am on." 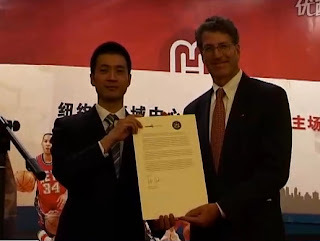 A 10/16/10 email from Gilmartin to Davidson with the heading "davidson takes china," attached a photo of Davidson speaking in China. The words "in conjunction with" could have left the impression that the city and state were part of the EB-5 offering. They weren't. They were part of the over all "job-creating project." “The government of New York State and the governor of New York State knows what a major decision it is you are about to take, and that is why I am here tonight,” he stated. “The third point is that this project and your participation will definitely create jobs,” Davidson declared. “The Atlantic Yards project will create thousands of jobs, both in construction and in permanent jobs that follow construction. And as a result, there will be billions of dollars generated in taxes that will be paid to the city of New York and the state of New York.” Whether there will be billions of dollars of taxes is questionable, but Davidson's answer dodged the issue of job creation. The "project" as pitched to investors includes the arena, infrastructure, and railyard. So the investors would have nothing to do with what Davidson described as "permanent jobs that follow construction." Not included in this "project" as pitched to the investors, would be construction of housing, office, or retail structures. Nor would billions of dollars be generated in taxes from this "project." Then Davidson, perhaps feeling expansive, asserted, “This project will be the largest job-creating project in New York City in the last 20 years." (Go to 4:40 of the audio.) “And one of the largest development projects of any type in New York City.” That first claim is untrue. 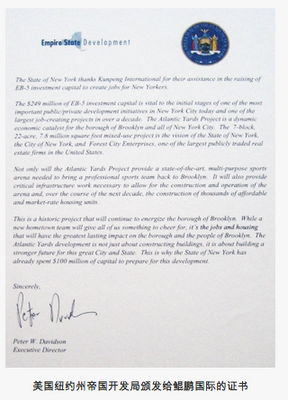 Also, the investors were never told they'd be putting money into the full "Atlantic Yards" project. But the smoke and mirrors worked.